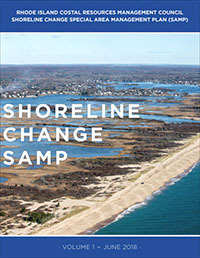 Shorelines are constantly changing, and Rhode Island coastal communities are increasingly experiencing the impacts. Storm waves can erode beaches and flood developed areas, while rising sea levels subsume land. Communities are asking how they can protect people and property, as well as vital infrastructure such as drinking water supplies, utilities, and roadways. The Rhode Island Coastal Resources Management Council, in coordination with the University of Rhode Island, has prepared a plan to help find solutions these problems, which are threatening communities in many areas along the state’s coast. 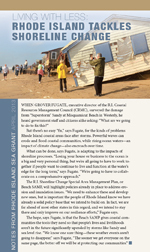 The Beach SAMP aims to improve the coastal resiliency of cities and towns throughout Rhode Island to the threats of erosion and flooding caused by storm events or sea level rise. Using up-to-date research and expertise from a wide range of public and private sectors, the Beach SAMP will help inform state and local policy and planning initiatives. Part of this partnership includes the maintenance of the Beach SAMP web site by Rhode Island Sea Grant. Maps of storm inundation with and without sea level rise for varying return periods for RI coastal waters. The Beach SAMP is supported by funding from the Rhode Island Bays, Rivers, and Watersheds Coordination Team, URI Coastal Resources Center, Rhode Island Sea Grant and the URI Coastal Institute. STORMTOOLS is a method to illustrate and display storm inundation, with and without sea level rise, for different types of storms that could occur along Rhode Island’s coast line. STORMTOOLS for Beginners (one-map stop for all residents of Rhode Island to better understand their risk from coastal inundation), Advanced STORMTOOLS (a series of maps that illustrate what coastal flooding could look like in the future under different storm scenarios), and information about the STORMTOOLS data. University of Rhode Island's Environmental Data Center (EDC) maps using simplified methods to estimate coastal inundation, a map tour of historic storms, and STORMTOOLS 101 apps. A summary of all exposed structures in each of the 21 coastal municipalities in Rhode Island within a variety of coastal flooding scenarios, and spreadsheets presenting the e911 structure type data sorted by coastal flooding scenario. An objective, quantitative assessment of the risk to structures, infrastructure, and public safety that coastal communities face from storm surge in the presence of changing climatic conditions, particularly sea level rise and coastal erosion. Uses state of the art modeling tools (ADCIRC and STWAVE) to predict storm surge and wave, combined with shoreline change maps (erosion), and damage functions to construct a risk index. Base Flood Elevation (BFE) maps of coastal study area that explicitly include the effects of sea level rise. SDE maps can also be used in place of FEMA FIRMs for the design of structures and infrastructure design, and are embedded in the CRMC risk based permitting system.